How Would Chicago Cope With the Terrorism That Ravaged Boston? As I draft this post the morning of Friday, April 19, much of the world is following the breaking news unfolding in and around Boston. One suspect in the horrific terrorist bombings at the April 15 Boston Marathon is dead, and authorities are seeking the second suspect. Authorities at this time believe the bombs were planted by brothers who immigrated here years ago and became part of American society. I hope and pray that no other lives are lost. I applaud the federal, state and local authorities who took control of the situation and quickly identified the suspects. I am in awe of those first responders and ordinary citizens who rushed to help those stricken by the two blasts set off near the Marathon finish line. I wish I could say, “This will never happen again.” But unfortunately, I believe there will be other attempts by cowardly monsters to cause harm and inflict terror for the sake of some sick ideology. We still don’t know what led the two men to allegedly erupt bombs that killed and maimed; we do know that they used materials readily available to just about anyone. And, I wonder: “How would my city cope if terrorists targeted Chicago?” After all, Chicago is an international city of nearly 3 million people; it has iconic office towers, an extensive public transportation network, grand public spaces, major cultural facilities — places where a terrorist bomb would certainly cause injuries, damage and possibly death. Like Boston — and cities and towns across our great country — Chicago has endured tragedy before and demonstrated resiliency to emerge stronger and more unified as Americans. Should terrorists attack us again, here in Chicago or elsewhere, I remain confident we’d see the same level of rapid response from law enforcement officials, the same unbridled desire to help from first responders and the tremendous outpouring of support from around the nation. This past week I made four trips downtown using our public transportation subway system. I had meetings in four office towers, including the 100-story Aon Center, in one hotel and in a major retail center in the heart of the North Michigan Avenue shopping district. I did not — nor will I ever — let the prospect of madness stop me from traveling within my city and living in a free America. 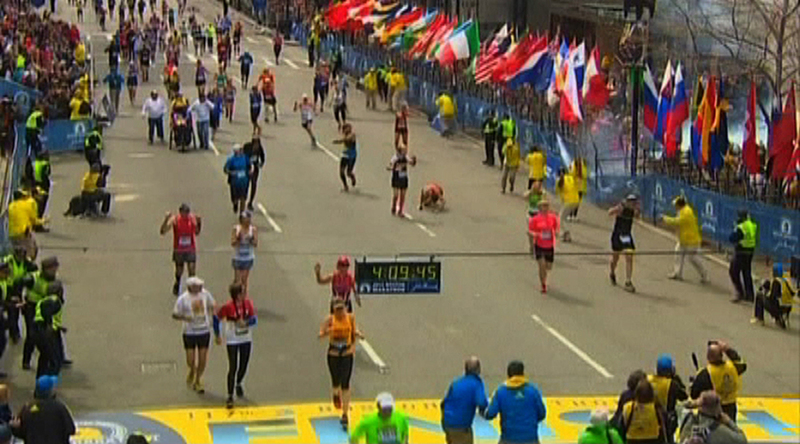 One image from this horrible chapter of 2013 that stood out for me was the line of flags along the Marathon route. These flags represented runners from nations competing in the race; they represented solidarity, freedom, sportsmanship and fairness. These flags stood tall as the carnage took place. This is the image I will retain from this tragedy. How will you remember the Boston Marathon bombing?